With the rapidly approaching six month mark since the release of Windows Vista, many of wait-and-see attitude computer users will be making a decision on whether or not to venture over into the unknown. Traditionally, many enthusiasts wait at minimum six months after a new OS release for initial bugs to be worked out. We’ve seen bugs come and go with Vista, and soon more users could be adopting Windows Vista. With Vista come great RAM requirements for optimal performance. While this RAM is put to good use with the enhanced prefetch features in Vista, it only serves to add yet another piece of hardware that potentially needs upgrading in the move. Vista 64-bit also adds the added benefit of raising the RAM limit. In a traditional 32-bit OS like WindowsXP or Vista 32-bit, users typically hit a max around the 3.25GB mark due to the addressing limitations. They will support 4GB, but you won’t be able to use all 4GB. 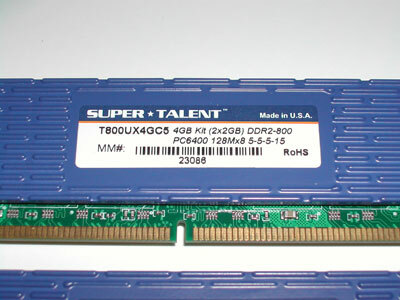 Today, we’ll be taking a look at one such 4GB kit from Super Talent. 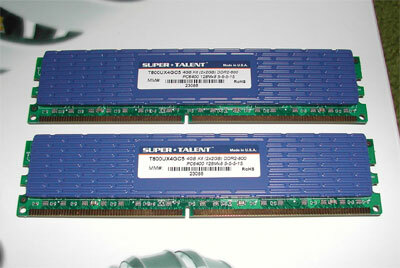 This is Super Talent’s initial venture into the world of 4GB DDR2, coming in with a rated clock speed of 800MHz and CAS 5 timings. Since they released this kit not too long ago, they have since released a CAS 4 for performance users. We’ll be examining the performance on a 32-bit Windows Vista platform as 32-bit OS’ are still the most widely used and of course, it’s what we have available for testing as well. For reference, the amount of RAM available in our testing is 3.32GB according to Windows Vista. Before we venture on to the benchmark results, let’s first have a look at the specifications and the modules themselves. ..:: Super Talent T800UX4GC5 Specifications ::.. The T800UX4GC5 is a high performance 4GB kit of DDR2-800 DIMMs that supports CL5 latency. It is ideal for gamers and power users with a 64-bit operating system such as Windows™ Vista™ Ultimate. This product has been verified with four 2GB sticks, for a total 8GB in Windows Vista Ultimate. This kit has been tested and is guaranteed to operate at 800MHz at 5-5-5-15 latencies at 2.1 volts. It has been tested as a matched pair of modules in a dual channel motherboard to ensure ultimate reliability, compatibility and performance. These modules are clad in our custom blue cast aluminum high-efficiency (HE) heatspreaders for optimum thermal performance. Efficient cooling is essential to optimize speed and to preserve the life of the DIMMs. ..:: Super Talent T800UX4GC5 - A Closer Look ::..
As you can see from the specs listed above, these modules are competitive with their rated frequency and timings required to achieve their rated frequency. Unlike what we have found in the past with other kit from Super Talent, the T800UX4GC5 kit provides a voltage for reaching the 800MHz rated frequency, 2.1V. This is a typical voltage level required for 4GB modules to attain an 800MHz frequency. In terms of product packaging, minimalist is the way Super Talent always seems to go. Contained within the product packaging there was a little more than an information card, but in comparison to some of more in depth guides offered by the big boys, this certainly left a little to be desired. The modules themselves are both double-sided. The blue, cast aluminum heat spreader is affixed on both sides of each module and should provide adequate cooling for the chips. 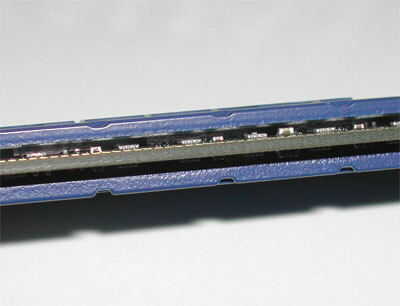 These heatspreaders felt much more substantial than those found on the DDR2-1066 modules reviewed previously and are identical to those found on the DDR2-1000 modules. A sticker declaring all of the information about the modules is placed on one side in the center of the heatspreader.